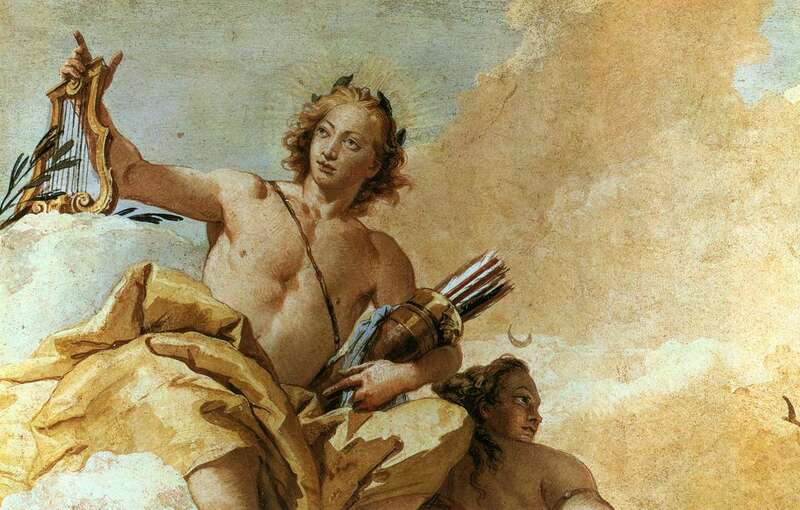 Apollo is the Sun. In the exalted solitude of his journey through the heavens each day, He hears the Harmony of the Spheres: the perfection of proportions in the orbits of the heavenly bodies – the Sun, the Moon, and the planets together resonating an etherial and celestial music never heard by mortals. Perhaps it was this celestial harmony Apollo remembered when He saw young Hermes strumming on the strings of an instrument the child God had made from the shell of a tortoise. 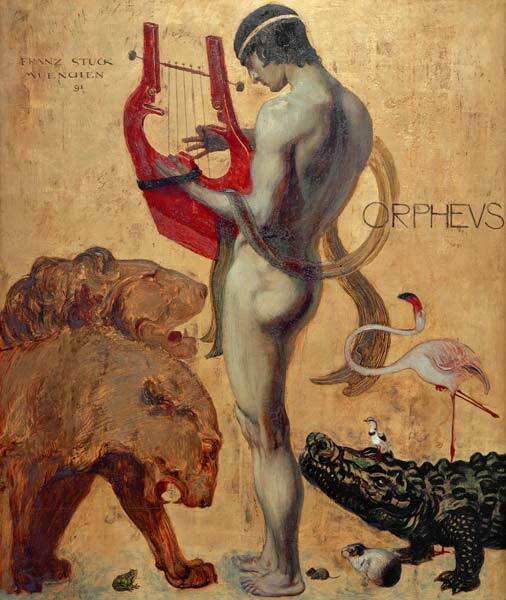 Hermes had stolen some of his cattle and Apollo was very angry, but when the Sun God heard the delicate yet enthralling sounds of Hermes’ lyre, His temper cooled and Apollo allowed Hermes to keep the cattle in exchange for the instrument. 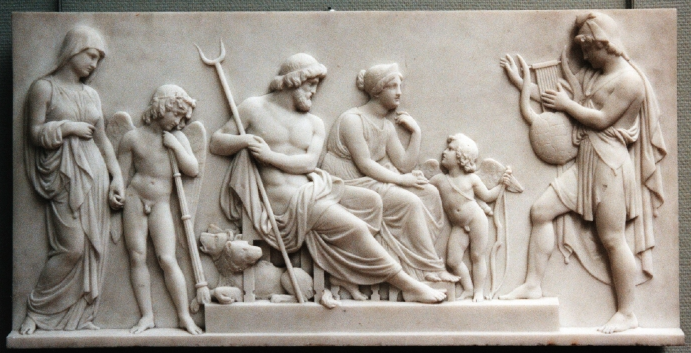 Apollo endowed the lyre with His solar power, inventing Music. Through His divine example He inspired men and women to live virtuously, to emulate the Gods, and to create Music and poetry for themselves. The Muses are the nine daughters of Zeus and Mnemosyne, through whom the Gods gave mankind knowledge of the sciences and the arts. First among these sisters is beautiful voiced Calliope, the Muse of Epic Poetry. On a time, Apollo knew Calliope and she bore him a son: this was Orpheus, who became the greatest poet and musician the world has ever known. 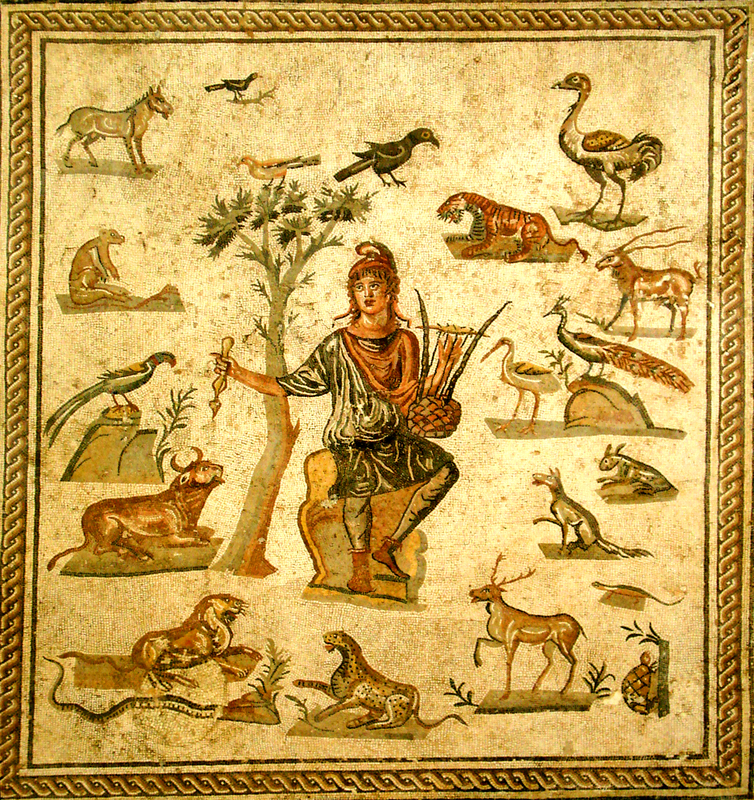 To Orpheus, Apollo gave the lyre. Inheriting the most beautiful of human voices from his mother and the most profound musical gifts from his father, Orpheus quickly mastered the lyre and upon attaining manhood he achieved vast renown for his ability to bring forth the most sublime music ever heard – none who heard Orpheus play and sing could be unmoved. His Music was so powerful and enchanting that not only humans but also wild beasts would stop and listen – transfixed. Even the winds and wild forces of nature were stilled upon hearing Orpheus and his lyre. Chiron, the wise centaur who taught so many of the world’s great heroes, prophesied that Jason‘s quest for the Golden Fleece would fail if Orpheus did not accompany the Argonauts. So Jason sought out Orpheus, and convinced him to join the mariners on their famous voyage. Jason, Orpheus, and the Argonauts had many perilous adventures together, and in the end they did succeed and win the Golden Fleece. On their voyage home they sailed near to the islands of the deadly Sirens – whom Odysseus had also encountered. 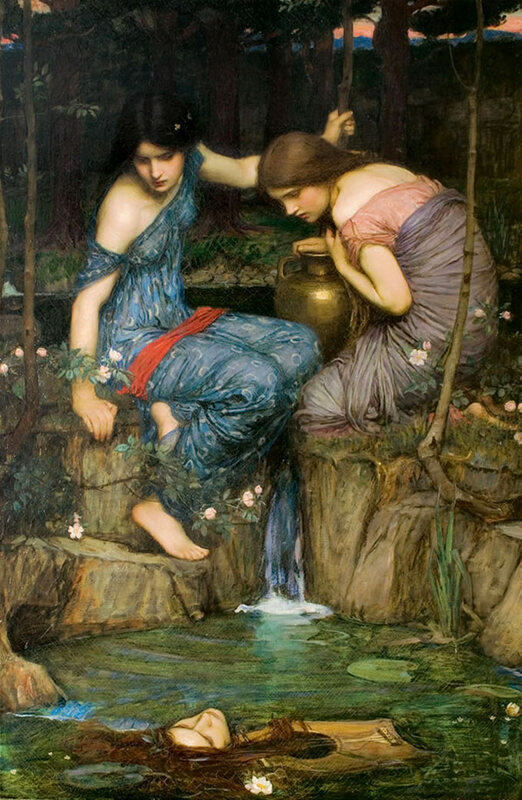 These beautiful female creatures lived on the Sirenum scopuli, three small islands from which they sang with bewitching voices such intoxicating melodies that passing sailors lost all reason and drove their ships upon the rocks that surrounded the islands, perishing in a vain attempt to reach the singers. Orpheus saved the ship and crew from drowning and destruction by playing on his lyre a Music more powerful and even more beautiful than that of the Sirens. 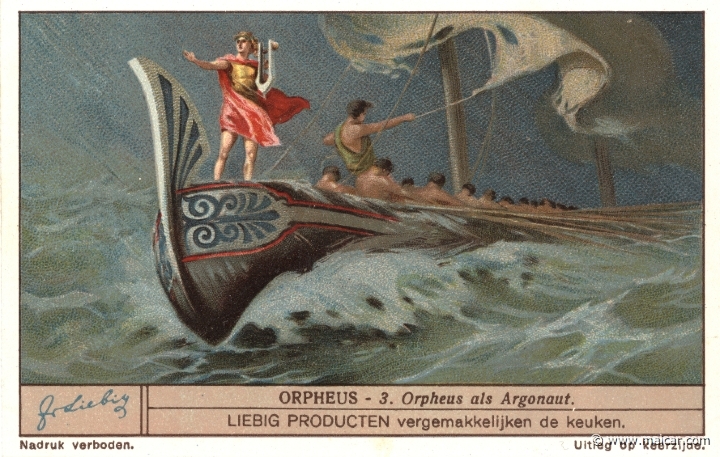 The Argonauts were enthralled by Orpheus’ Music, paid the Sirens no heed, and sailed by safely. 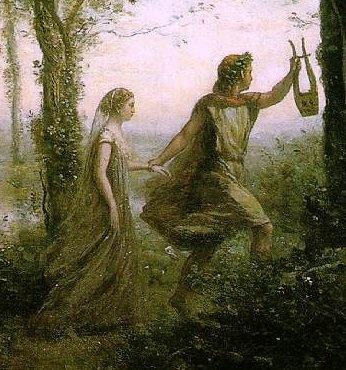 Orpheus fell in love with Eurydice, a nymph of the forest. He courted her with Music, giving voice through song and with the lyre to the depths of his passion. For a time, the woods and fields resounded with the Music of Orpheus’ love for Eurydice, and all creatures who heard it felt their hearts overflowing with joy and wonder. How could Eurydice resist such a courtship? Never had such a sweet Music of love been heard. Merry was the feast they celebrated at their wedding, when all of their friends joined them in singing, and in dancing to Orpheus’ surpassing Music. For a time, their peace, contentment, and joy together knew no bounds. One day, when Eurydice was gathering flowers in the woods, Aristaeus, a young hunter, saw her from afar. Bewitched by her exquisite beauty, he began to pursue her through the forest. Eurydice fled. In her haste to escape, she stumbled and fell upon a viper, which bit her, and she quickly died. When Orpheus learned of the death of his beloved young wife, his grief overwhelmed him. Now, all who heard his Music lost heart, and wept. Where once all marveled at the joy and serenity which filled their hearts upon hearing Orpheus play and sing, now all who heard his Music were overcome with sorrow and bitterness. This time, the Music brought no solace to the musician: as powerful and moving as his laments for lost Eurydice were, Orpheus found no cure for his broken heart. Life without Eurydice seemed empty, meaningless, a hollow pretense. In desperation or folly, he resolved to travel to the Underworld, to sing before the thrones of Hades and Persephone, the Gods of Death, in plea for her return to the lands of the living. It was a long, dark journey. The road to the Underworld led into the depths of the earth where few have trod. Although Heracles, Odysseus, Aeneas and a handful of other brave heroes have made the journey, it was Orpheus alone who brought Music to Hades. Fierce Cerberus, the three-headed hound who guards the Gates of the Underworld, ceased to threaten, and lay fawning on the ground when Orpheus played for him. Charon, the taciturn ferryman of Hades, refused payment from Orpheus when he heard the tones of Orpheus’ lyre – never had he heard such wondrous sounds. Never before had one brought Music to the Land of the Dead. Five are the rivers of the Underworld: Styx, River of Hatred; Acheron, River of Pain; Lethe, River of Forgetting; Phlegethon, River of Fire; and Cocytus, River of Wailing. One by one, Orpheus was carried over the dark waters, body and spirit kept alive and whole by the life-giving power of his divine Music. Finally, he stood before the throne of the God of Darkness. In the supreme silence and utter darkness of the Underworld, surrounded by the shades of the multitudes of the dead, Orpheus alone was a living, breathing man. The King and Queen of the Land of the Dead regarded him from their thrones, without speaking, without moving, as if they were made of the very stones that surrounded them. Into the silence and the emptiness he wove a song of light. Orpheus played as he had never played before, a song that evoked the warmth and hope of the Land of the Living, even in the deep forgotten memories of those who had lived and died in the ancient morning of the world. 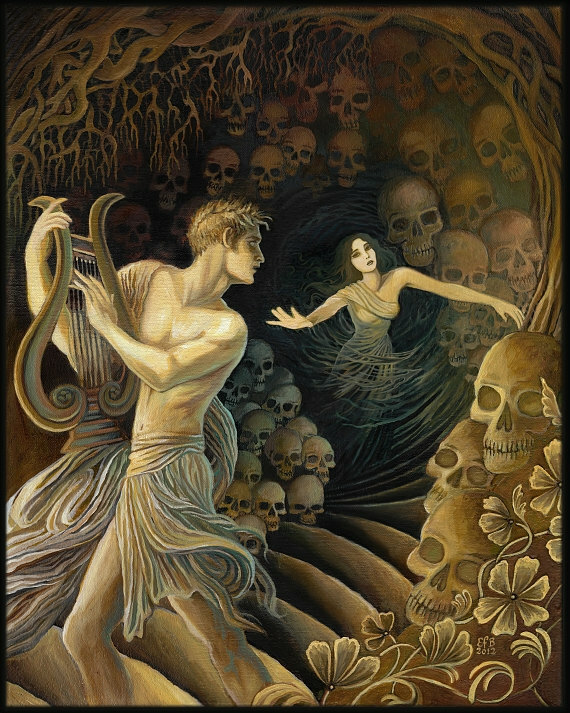 Before the thrones of the Hades and Persephone, Orpheus played a song of the joy of life, of the joy of love, a song shining in the darkness that filled the silent halls of the Underworld with the Music of his undying love for Eurydice. And listening to the Music of Orpheus, the hearts of Hades and Persephone were moved, and they wept. So strong was the Music Orpheus played and sang in the Underworld that Hades relented, and the shade of Eurydice was led before the thrones, and the cold hand of his dead bride was placed in Orpheus’ hand. Turning away from the dark thrones, Orpheus led the silent ghost of Eurydice back on the long journey to the world that is warmed by his father the Sun, where living things thrive and grow. Together they crossed Cocytus, the River of Wailing, and Phlegethon, the River of Fire. Through the power in Orpheus’ lyre he did not forget their destination as they passed over Lethe, the River of Forgetting, and he felt no agony as they passed over Acheron, the River of Pain. Taciturn Charon rowed them across Styx, the River of Hatred, yet the heart of living Orpheus felt no loathing. Eurydice sat behind him in the boat, and she did not speak, or move. At last, Orpheus passed through the Gates of the Underworld, into the sunlight. Fierce Cerberus lay sleeping where Orpheus had left him at the beginning of the journey into darkness. His heart leapt, and in his joy at their return to the world of the Living he forgot the charge of Hades and turned, and looked upon Eurydice, who had not yet passed the Gates. And Eurydice looked back at him for a moment in despair, for even as she felt the return of life stirring within her as she peered out from the shadows at the sunlight, she felt herself slipping away, and was pulled back into the Underworld, from which she has never returned. Orpheus was despondent, and wandered the world aimlessly after that. Mad with grief, he attempted to enter the Underworld again, but his Music had lost its power to captivate, and Cerberus did not allow him to enter the dark Gates. He lost all motivation to live like other men, and became like the wild creatures of the forest for whom he played, subsisting on what little he could find in the woods, and sleeping on the ground like an animal. After some years of this nomadic and fruitless existence, Orpheus came upon a group of the Maenads, female devotees of the wine God Bacchus who were drunk and feasting in the woods. Orpheus played for them but they were unmoved and became enraged at his interruption of their debauchery. In a mad frenzy, the drunken women attacked Orpheus and killed him. Not content with the death of the divine musician, the Maenads cut off his head and threw it and his lyre into the river Hebrus, from whence they floated out into the sea with a sorrowful murmuring, and made their way to the Isle of Lesbos. The soul of mad Orpheus was reunited with that of Eurydice in the Underworld, where they remain to this day in the deep silence of death. 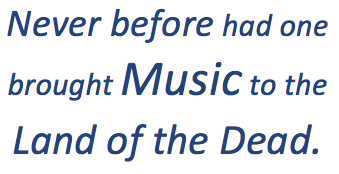 By walterbitner in Music, Philosophy on January 8, 2016 .